We have Orinoco and Atabapo Altums. They have been completely acclimated to city tap water and higher pH. Their fin span can get very large. From tip to tip they can get up to 12 inches in a larger tank. They will mirror the size of discus in the same tank although their rate of growth may be different depending on how often and what you use to feed them. 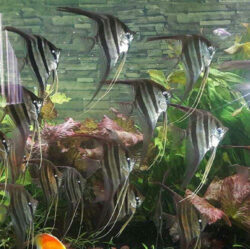 All of our altums are great tank mates for discus fish. The are hearty eaters and are very exciting to watch as they are very active. 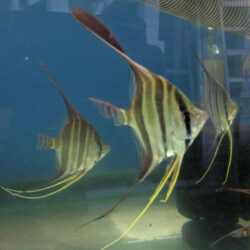 We also find that they are most active and vibrant in groups of six or more. 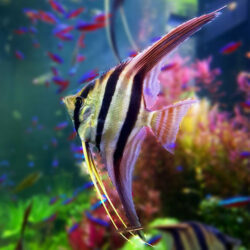 Altums are a mid to upper tank dweller but will go to the bottom for food. They are fine for planted tanks as they will not damage live plants. Although they prefer live foods like blackworms and shrimp, they will eat a variety of dry foods like pellets, large flakes, as well as meat mixes like beefheart.